Professor Emeritus of Art E. Dane Purdo died Tuesday, August 19 in Neenah at the age of 88. Professor Emeritus of Art E. Dane Purdo joined the Lawrence faculty from Milwaukee-Downer College in 1964 and taught here until his retirement in 1991. 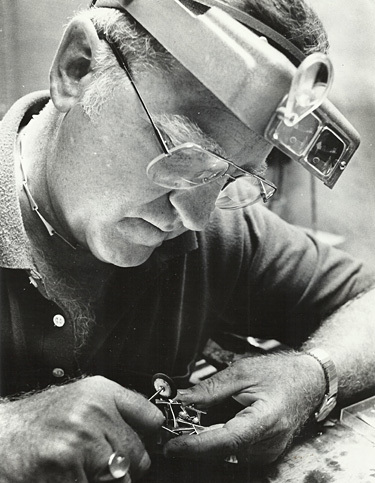 An accomplished silversmith — he designed Lawrence’s Faculty Marshal Mace carried at the head of academic processions as well as the Presidential Chain of Office and usher batons —Purdo was one of 21 members of the Milwaukee-Downer faculty who came to Lawrence in 1964 as part of the consolidation with the former all-women’s college. He began a 36-year teaching career in 1955 at Milwaukee-Downer as both studio artist and art historian. After the consolidation, he taught courses in metals and ceramics in Lawrence’s art department until his retirement in 1991. A multi-faceted artist/teacher given to sartorial splendor, outside the classroom and art studio he also was well known for his skills on the dance floor and the ski slopes. His interests in music and theatre were manifest in Attic Theatre productions, the St. Mary Parish resurrection choir, as a member of the One Nighters play-reading group and as a volunteer at the Fox Cities PAC. His work has been recognized with numerous honors and awards and much of it resides in public and private collections around the country, including the Detroit Institute of Art, Chicago Art Institute, the Bergstrom Mahler Museum, The Kimberly Clark Corporation, The Fox River Paper Company, the First Congregational Church and Memorial Presbyterian Church in Appleton. 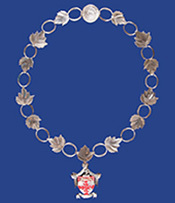 The Presidential Chain of Office, worn during formal institutional functions, was one of Prof. Purdo’s creations. Purdo earned both his bachelor’s and master’s degrees in art history from the University of Michigan and an M.F.A. degree in silversmithing and ceramics from Cranbrook Academy of Art in Bloomfield Hills, Mich. A year after earning his M.F.A., while teaching at Milwaukee-Downer, he was awarded a U.S. Fulbright grant, which he used to pursue his interests in silversmithing at the Royal College of Art in London, becoming the first American to register his hallmark at Goldsmith Hall. He was preceded in death by his loving wife, Irene Purdo, in 2007. He is survived by three children, son Michael (Cindy) Purdo, Roswell, Ga., daughters Mary (James) Peksa, Wausau, and Melanie (Sam) Bomier, Neenah, four grandchildren and a sister Gertrude McGuire. A private family service is planned. Lawrence will celebrate Purdo’s life with an on-campus memorial on a date to be determined. In lieu of flowers, the family has asked donations in his memory be made to Lawrence University designated for the E. Dane Purdo Art Scholarship Award, 711 E. Boldt Way, Appleton, WI 54911.